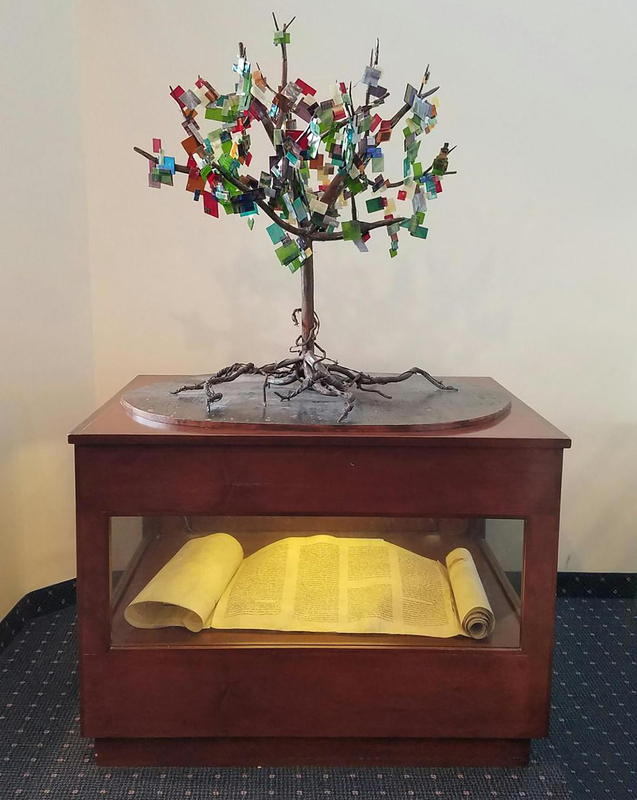 The Young Israel of North Woodmere Holocaust Memorial (found in the main lobby) has been designed to represent the survival of the Jewish people and their triumph over the ultimate adversity: the attempt at extermination. The true triumph, as expressed by many survivors of the Holocaust, and the repudiation of the Nazi's intentions, is a community such as ours where children abound observing Judaism in total freedom. The memorial is shaped as a “Tree of Life” that roots in the horror and genocide of the Second World War but nonetheless produced a solid trunk that is the base for a multitude of colorful leaves. Out of horror and darkness emerged light and color. Designed by Eli Chaikin, this sculpture was executed by Annette Blady Van Mill, who is the daughter of a Holocaust survivor and a cousin to the Blady family who dedicated this memorial. The scroll incased in our Holocaust Memorial is itself a “survivor” of the Holocaust. This partial Torah scroll was amongst 38 other scrolls rescued from the attic of a warehouse in Czestochowa, Poland. At great risk to himself and everyone else involved Mr. Rapaport, a Jewish court Stenographer from Melville, Long Island, smuggled this partial Torah scroll out of Poland and brought it to the United States. Nine of the rescued Torah’s were repaired and are in use in various Synagogues. This scroll in display at the Young Israel of North Woodmere was donated in order to be displayed as a memorial to the Holocaust. Whereas the Nazis probably saved these Torahs to display them in a museum dedicated to the extinction of the Jewish race, we display this scroll as a testament to the survival of the Jewish people and to the resilience of our Torah.